The Guardian has launched a new “headnotes” series, as part of its Law blog. The series, which provides a brief and accessible guide to cases of topical interest, is likely to be of interest to prospective Law students. 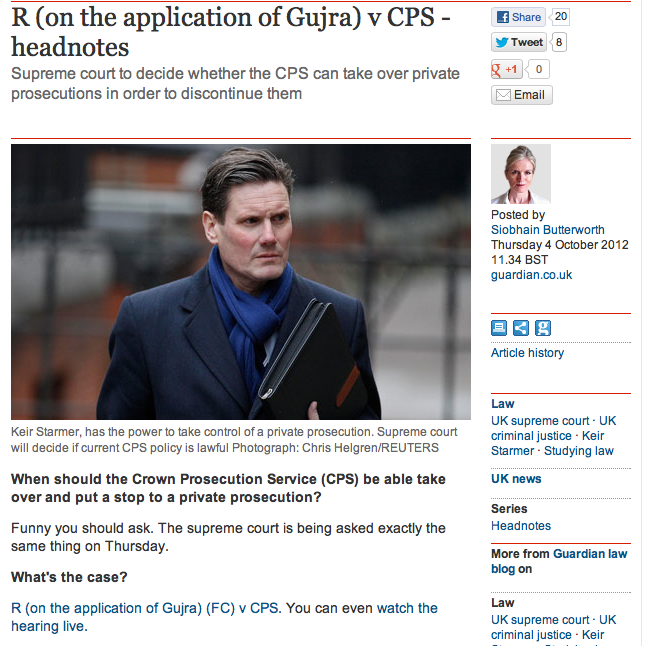 The first case to be featured in the series is R (on the application of Gujra) v Crown Prosecution Service. The case involves a challenge to a decision by the Director of Public Prosecutions to take over a private prosecution – that is, criminal proceedings brought by one individual against another – in order to discontinue those proceedings. Most prosecutions are brought by the state, in the form of the Crown Prosecution Service. But if the CPS decides not to prosecute – either because it thinks there is insufficient evidence or because it thinks the public interest does not warrant prosecution – it may be open to an individual citizen to do so. In Gujra, the DPP took over the proceedings (in which Mr Gujra alleged he had been the victim of criminal assaults) and discontinued them on the ground that there was not thought to be a realistic prospect of conviction. This raises an important question about the extent to which the state – in the person of the DPP – should be permitted to halt private prosecutions. As Lord Mance observed in Jones v Whalley  UKHL 41, “[t]he right of private prosecution operates and has been explained at the highest level as a safeguard against wrongful refusal or failure by public prosecuting authorities to institute proceedings”. It thus provides – as the Guardian piece puts it – “a safety net against failures, refusals and wrongdoing on the part of those whose job it is to bring public prosecutions”. When the Supreme Court decides the Gujra case, this will help to determine more precisely the extent of that “safety net”. Next A right to administrative justice?